It was added too over the next couple of years, and in the 13th century it had part of its floor raised so that a passageway was created. They did that to build a bone-house (ossuary). 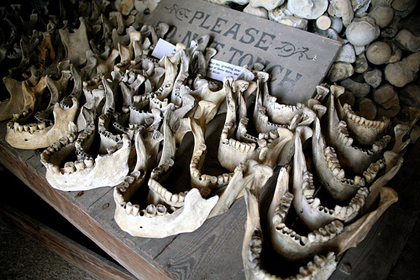 In it they neatly stacked, a huge collection of medieval skulls and bones. 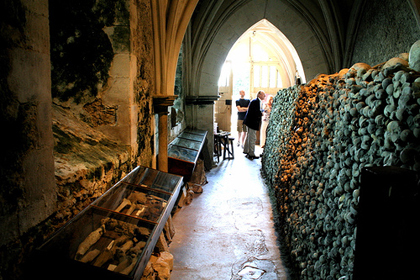 There’s a lot of disagreement as to why the bones were put there – but most think they were dug up when the Church was extended, or when fresh graves were made. Either way – there are a serious amount of bones. In 1910, they examined the collection and found around 8,000 – which means the collection is made up of the remains of around 4,00 men, women and children. It really reminded us of the catacombs in Paris. Although maybe not quite as impressive a construction, it’s definitely worth checking out.